Home News ISO 13485:2016: Medical certification is a continual achievement. Companies that achieve ISO 13485:2016 certification for Medical Device Quality Management must meet the stringent product quality requirements of the International Organization of Standardization (ISO). ISO 13485:2016 certification involves demonstrating best practices throughout all stages of a product’s lifecycle: from prototype through manufacture. 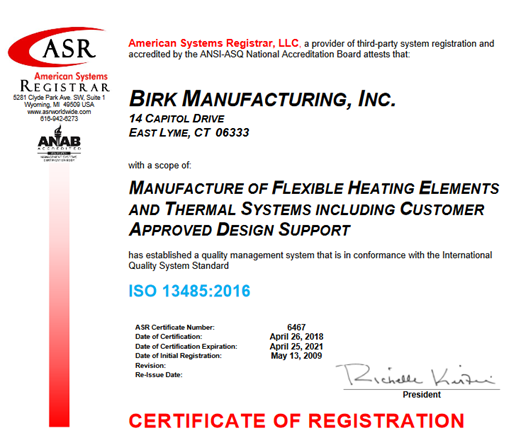 ISO 13485:2016 certification provides Birk customers real savings in terms of cost and time to market. All of the pre-qualification has already been done by ISO. This gives Birk the ability to hit the ground running full-speed and deliver fast turnaround on prototypes and production.